During the mid-1900s a man by the name of L. Ron Hubbard (1911-1986) began to study a field of metaphysics he called Dianetics, a word he coined to describe "what the soul is doing to the body." The book he wrote about his studies explained that humans have lost touch with their environment. People, he said, don't have spirits. They are spirits (literally thetans, from the Greek letter theta, which is often used as a symbol for spirit). What they have is a mind and a body. But they have forgotten this. They have forgotten who they really are. They live false lives, concentrating on all the wrong things. As a result, they suffer stress-related, psychosomatic illnesses and have lost the ability to be happy. Drawing from what he estimated were some 50,000 years of religious wisdom, Hubbard believed he was the first to apply scientific methods and discoveries to the great questions of life: Who am I? Where did I come from? Where am I going? In this sense, the Church of Scientology ("scientology" literally means "knowing how to know") is, according to its founder, the first religion that combines scientific principle with religious belief. It's a universal church for the new age, drawing from the fields of both science and religion. His ideas were convincing enough to draw the attention of some very well known people. Actors John Travolta and Tom Cruise are among the most frequently mentioned high-profile members of the church. Hubbard taught that humans were basically good, not evil. Experience and wrong thinking have taught them to commit evil deeds. Disagreeing with the Christian position first expressed by the apostle Paul (see Paul, Saul of Tarsus), Hubbard asserted that evil is not a part of basic human nature. It is something people do, rather than something they are. What this means is that humans can improve by advancing spiritually. It takes work, training, and, according to critics, a lot of money, but it is something people can accomplish if they apply themselves. As soon as Scientology began its phenomenal growth, attracting famous people and a big bank account, cries of "cult" began to be heard throughout the land. Scientology has a lot in common with what people consider cults to be. It had a charismatic, high-profile leader. Stories about mind control and secret initiation rites began to circulate. People were said to be afraid to go against the wishes of the governing hierarchy. The high-profile adherents were called fronts or marketing tools. Scientology has a lot of followers, and it is growing by leaps and bounds. It also has a lot of detractors, who say it will cost the average convert some $400,000 over the course of an average lifetime. What Scientology calls therapy, its critics call brainwashing. What Scientology calls a church, its detractors label a cult. Scientology has been granted tax-exempt status as a church. L. Ron Hubbard is gone, but controversy still surrounds him. The L. Ron Hubbard Scientology Center in Los Angeles, California. Although a celebrity cult of the rich and famous, Scientology intimidates and controls its rank-and-file members. Few of the controversial new religious movements have received as much negative publicity or been investigated by so many government agencies, including the Internal Revenue Service, the Food and Drug Administration, and the Federal Bureau of Investigation, as has Scientology. The founder, Lafayette Ronald Hubbard (1911–1986), known to Scientologists the world over as “L. Ron,” is said to have studied many Eastern philosophies as he journeyed around the globe. A background in mathematics, engineering, and nuclear physics grounded him in the physical sciences at the same time that he was exploring the human mind through an examination of Freudian psychoanalytic theory. When injuries suffered in service as a naval officer during World War II left him crippled and blind, Hubbard claimed that his ability to draw upon mental insights allowed him to cure himself of his disabilities. He called this process Dianetics, and he first outlined its central elements in article for the May 1950 issue of Astounding Science Fiction magazine. Later that same year, Hubbard published Dianetics: The Modern Science of Mental Health. Dianetics states that there are essentially two components of the mind, the analytical and the reactive. The analytical aspect, similar to the Freudian concept of the ego, is the consciously active and aware part of the mind. The reactive mind comes into play during times of intense stress when, very often, the analytical facet shuts down. Although the individual may not be aware of the process, the reactive mind absorbs and records every nuance of emotional, mental, and physical pain suffered by him or her. Hubbard called the impressions or “recordings” made by the reactive mind during moments of trauma “engrams,” and while the conscious, analytical mind may remain unaware of their presence, they can cause debilitating mental and physical problems and inhibit a person’s full potential. The Dianetics process called “auditing” enables a troubled or inhibited individual to explore those engrams preventing his or her development and to be “cleared” of such impediments by an “auditor,” a minister of Scientology. Once a Scientologist has been “cleared,” he or she may continue progress to a state wherein freedom from all the constraints of matter, energy, space, and time is attained and a transcendent level of near-perfection is achieved. Shortly after the publication of Dianetics, Hubbard established the Hubbard Association of Scientologists International in Phoenix, Arizona. 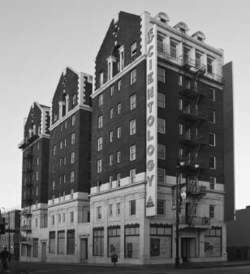 In 1954 the First Church of Scientology was founded in Los Angeles. Increasing demand for information about Scientology led to the establishment of the Founding Church of Scientology along with the first Academy of Scientology in Washington, D.C., in July 1955. Today, Scientology claims around eight million members and over three thousand churches worldwide. His mother, Betty Wordie, was a high ranking Scientologist. During Tuesday night's new episode, the 47-year-old went off about celebrity Scientologists, including John Travolta, who in her opinion, refuse to open their mind and their eyes to what's going on in the church. In 1996, a Scientology advertisement in the New York Times stated, "You may wonder why German officials discriminate against Scientologists. His majority (560) much greater than num of scientologists in Adamsdown ward - or is it? I can think of no other word," Haggis wrote in the August 19 letter that was later published on the blog of former Scientologist Marty Rathbun. Scientologists, the FDA claimed, had been falsely promoting the E-Meter as a medical device. But I was undeterred in my quest to be recruited by a Scientologist, so I approached the gray-haired woman and said hello. Hubbard believed any words spoken were recorded in what Scientologists call the "reactive mind" and could later affect the mother and the child. They parted 'amicably' at the end of January, according to his sister, Lee Anne DeVette, his new publicist and also a Scientologist. Although Cruz had not become a Scientologist like Cruise, religion did not cause the split. The Scientologist newspaper 'Frihed' had reportedly accused Jorgen Pedersen of Ekstra Bladet, a newspaper, and German film producer Walther Heynowski of being connected to the East German intelligence agency Stasi. And you'll find no person in the world more zealous than a former Scientologist, believe me.